In september 2017 Jubileon launched their first Kickstarter campaign with the really cool Superellipse. This piece was really classic but with a nice design. You can find it HERE . Now the independent brand from Singapore is back with an evolution of their first watch. 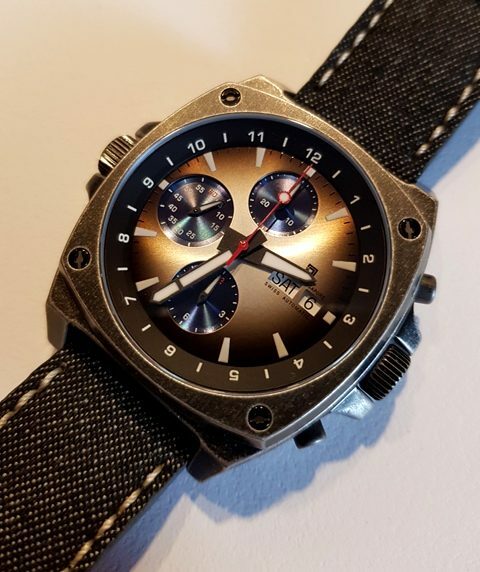 This one, that they just launched on Kickstarter (5 April), is a pretty cool chrono. To be honest I’m quite astonished by the level of quality of this piece. Not just by the design, which is really strong, but also by the whole… Including the movement. 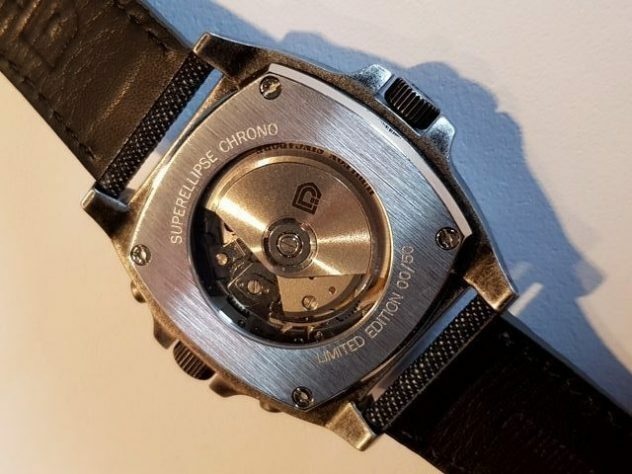 Because Yes, powering the Superellipse Chrono is the well known ETA 7750 Valjoux movement. 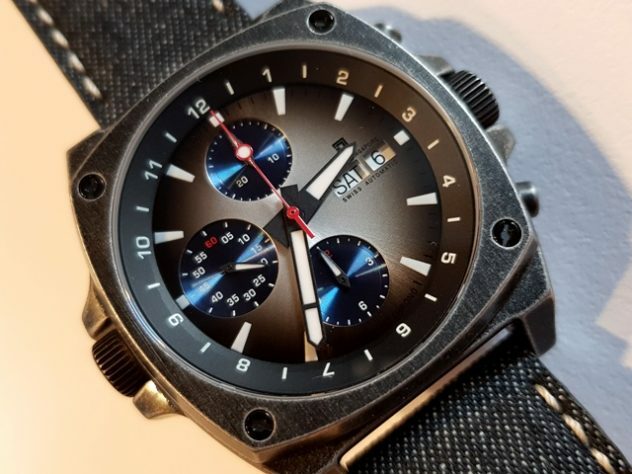 You can find this movement in almost every chrono in the market, but rarely at the price of 799$. Well thanks to Kickstarter you will save 33% of the future price ; so honestly it’s a great deal. Let’s jump on the details of this piece. One thing that is sure is that this new watch is instantly recognisable thanks to its design. The Superellipse Chrono inherits the iconic shape of the original Superellipse even if it looks more strong. A distinctive element is the left-hand crown, which rotates the inner bezel that serves as a secondary time indication if ever you are out of your regular timezone. On the other side we have the right-hand crown that will adjust your local time. Above and below this screwed-down crown there’s the pushers with which you can easily control the chrono. Thanks to this double symmetrical crown the Superellipse Chrono has a well-balanced look. The 42 mm case (Lug to Lug : 51mm / Crown to Crown : 49mm / and 15mm thick) is made in Stainless steel 316L in either IP Vintage Gunmetal or IP Vintage Rose Gold. 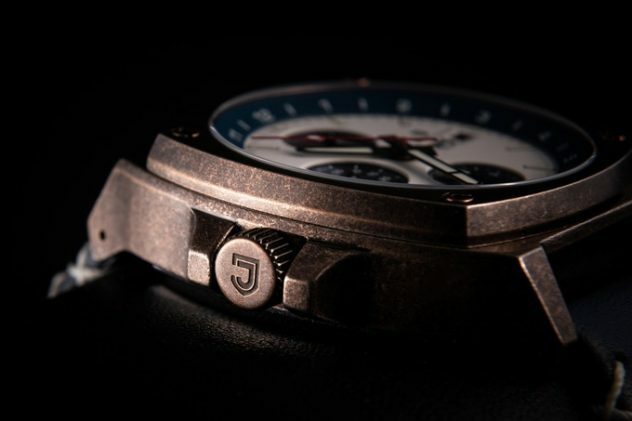 Combined with the overall design of the watch this case looks rugged but the end result is stunning. 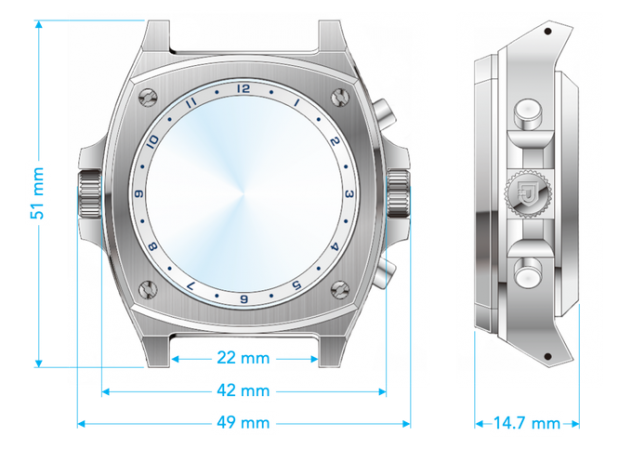 Great thing is that you can build your watch following your taste as Jubileon is offering 18 design options for the watch head. You can even choose if you prefer hands or disk for the seconds subdial that you can find at 9 o’clock. 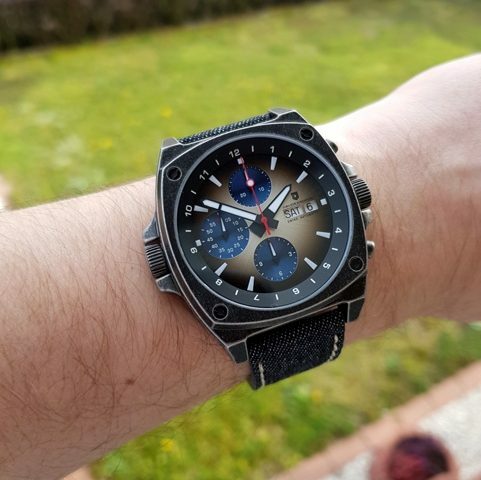 As you can see on the picture below, the grey dial with sunburst style fits perfectly with the gunmetal case and the blue subdials. There’s BGW9 lume on the hands, sub-hands and hour markers. Note that the chrono hand is coloured in red, which is really useful. On the back, you’ll have the chance to see the movement thanks to a sapphire with anti-reflective coating. • Denim Calfskin, in Blue or Grey. • Padded Calfskin, in Blue, Brown, Tan or Black. Well, the end word will be “eye-catching“ ; For sure with this piece you will stand out from the pack. The watch is very comfortable despite its dimensions and it looks like nothing else you have ever seen. For sure, in pictures you will maybe say « No, it’s not for me », but honestly, even with my small wrist (17 mm) I use to like it. You have to wear it to love it and be sure that you will not be disappointed with the Jubileon Superellipse Chrono. If you like strong watches with a rugged style this one is probably for you. So, if you’re interested jump on their Kickstarter campaign by clicking HERE.